Edited by bullrider, 23 August 2008 - 10:03 PM. For more information on the Windows XP Recovery Console read http://support.microsoft.com/kb/314058. 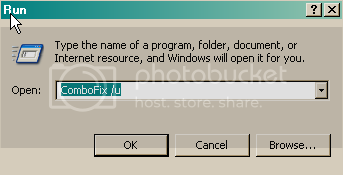 Once you install the Recovery Console, when you reboot your computer, you'll see the option for the Recovery Console now as well. Don't select Recovery Console as we don't need it. By default, your main OS is selected there. The screen stays for 2 seconds and then it proceeds to load Windows. That is normal. Edited by bullrider, 24 August 2008 - 03:36 PM. C:\WINDOWS\system32\oembios.dat (Trojan.Agent) -> Quarantined and deleted successfully. Select Update Using Sun Java's Website then click Search and click on the Open Webpage button. Download and install the latest Java Runtime Environment (JRE) version for your computer. restore it where? open it with what program? Ok I have completed all the steps thank you very much for your help! Im assuming I picked up these viruses from fake atcive x control bars at the top tool bar going to web sites correct? Again thank you for your time and help.